And so it begins – the holiday season is officially here! Woohoo! I really do love this time of year – from the baking and holiday foods, to the festive lights decorating downtown to of course being able to spend time with my family – what’s not to like? Here’s where we stayed- it was really nice and a short walk from the main lodge which meant just a short walk from the pool and fitness center! (yes, I got in a 6 mile treadmill run one day while the kiddos were splashing in the pool). And what would Thanksgiving be without all of the other glorious food? Before getting on the road, we decided to do some pre-vacation pampering! 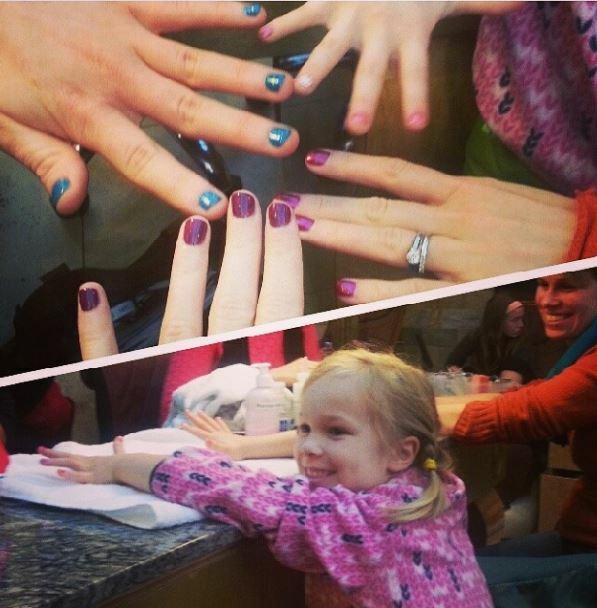 I went with my niece and two of my sisters-in-law and we got our nails done. I brought supplies with me to make some candy turkeys I’d found on Pinterest – and they were a hit! The kids loved making them and trying to steal all the candy/cookies/frosting/etc. they could get their hands on. We went sleigh riding down what a local called “Suicide Hill.” I mostly watched and ran up and down the hill to keep warm, but couldn’t help but take photos and video of the fun. My favorite? Sending Oliver down the hill in a laundry basket that we had in the car. Keeping the Thanksgiving morning tradition of running alive, we found a 5k in Wheeling and ran it – with a few of the other family members! It was tons of fun. I ran the whole race with B’s cousin who’s the girl in the front in the blue hat in the pic below – she’s fast and came in 4th in her age group (14 and under). The whole gang who ran! And of course just all around shenanigans and playing with my niece and nephew and cousins-in-law. He’s a pretty good reader for a preschooler huh? Teaching her some of my favorite old hand-games. Pirates are completely normal on Thanksgiving, right? Didn’t they come over with the pilgrims? And that was it! From traveling to West Virginia and then to way out northeastern Ohio for bowling, I’m somewhat feeling I need a vacation from my vacation! How was your Thanksgiving? Do you travel for the holiday? What did you make for the holiday? B and I were in charge of desserts! We also were to make a vegetable – so we made roasted squash and Brussels sprouts! Did you try any new foods? Yes! Shoofly pie, that B and I made, as well as a slice of a bacon bomb. Do you have any fun family traditions during the holidays? Bowling with B’s family the Sat. after Thanksgiving has become a great tradition! Did you do any Thanksgiving day races / Turkey Trots? What are you most looking forward to about the coming month or so of the holiday season? Love Actually, Christmas music and seeing my family again!